This past Thursday I had the pleasure of attending Allentown Arts Commission’s 24th annual Arts Ovation Awards Luncheon held at the Holiday Inn Center City Allentown. The arts hold a prominent place in Lehigh Valley culture and collectively make our job promoting the region that much easier. I was glad to see the program insert listed all past recipients. This year’s honorees join an impressive “who’s-who” list in Lehigh Valley’s art world. The ballroom was packed with those happy to applaud the 2012 winners and their contributions. Entertained was provided by Dieruff High School’s Jazz Band and Civic Theatre. All in all, eight awards were bestowed. Joan and John Gaydos, artists and art advocates, won the Special Recognition Award. Their collective accomplishments are far too numerous to mention. An Outstanding Service Award went to Arts-in-the-Park, the annual juried exhibition held every June at Allentown’s West Park. People First Federal Credit Union won the Contribution to the Arts Award, deserved not only for helping raise funds for events like Mayfair, but for providing volunteers from their staff to help. Outstanding Achievement Award for Performing Arts was bestowed to Patrick Mulcahy, producing artistic director of the Pennsylvania Shakespeare Festival. If you’ve never attended, you don’t know what you’re missing. Outstanding Achievement/Visual Arts went to Rosemary Geseck, a name I didn’t think I knew until I heard the 130 foot mural on Phoebe Floral’s building is an example of her work. David Venditta from The Morning Call received the Outstanding Achievement’s Literary Award for his compelling series and book “War Stories: In Their Own Words” local veterans’ tales from World War 1 through Vietnam. Only the fourth recipient of the Emerging Artist Award was Josh Berk, an author of books for teens, and executive director of the Memorial Library of Nazareth. 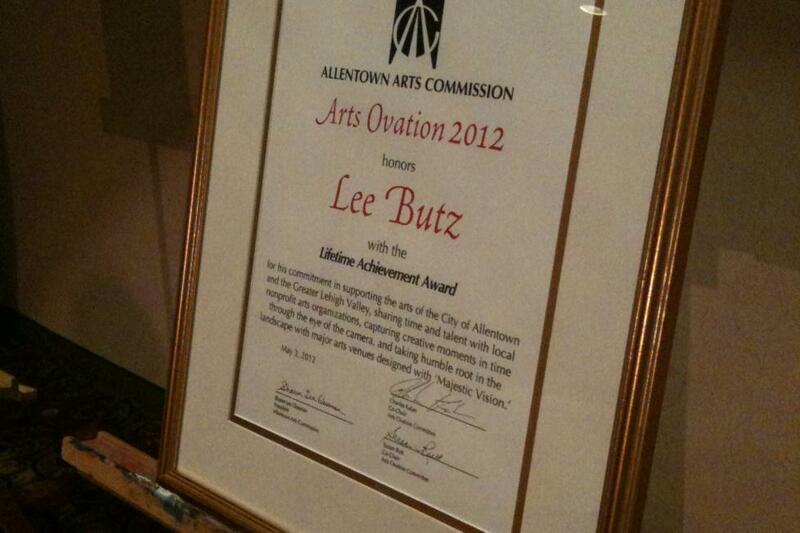 Last, but not least, our “good friend and neighbor*”, Mr. Lee Butz, won the third ever Lifetime Achievement Award. (*That’s how he autographed my copy of Majestic Vision, his impressive book of photography shot at the Pennsylvania Shakespeare Festival.) This gentleman supports more local arts organizations than you could imagine and his company has built or restored many of the magnificent arts and education venues in the valley. In addition to the awards, 12 scholarships were awarded to students from William Allen, Louis E Dieruff and Allentown Central Catholic High Schools for their excellence in music, dance, theater and visual arts. This is the organizations way of “paying it forward”.